Perhaps the most surprising information on the chart? Since 2014, there has been more than 500 firms in the S&P 500! Silverblatt, Howard. 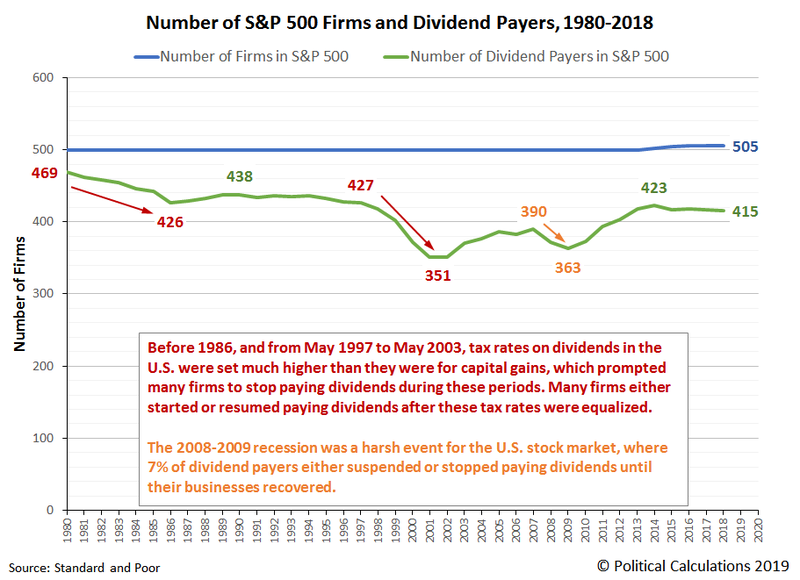 S&P 500 Dividend Payers. Standard and Poor S&P Dow Jones Indices. [Excel Spreadsheet]. Accessed 2 March 2019. Mauboussin, Michael J. The Real Role of Dividends in Building Wealth. Legg Mason Capital Management. [PDF Documents]. 25 January 2011. Political Calculations. What Caused the Dot Com Bubble to Begin and What Caused It to End? [Online Article]. 15 December 2010.